Originally found on Tendinopathy Rehab. The blog (subscribe here) today we will focus on one considerations in hip and gluteal tendon rehab – whether to do weightbearing or nonweightbearing rehab. Of course the answer is that both may be important, but let’s explore this a little. My interest in this was sparked by a paper that come out last year. Dieterich et al. 2015 were interested in gluteal muscle onset during common non-weightbearing and weightbearing gluteal rehab exercises. A simple idea with some really useful clinical messages to come out of it. What they did: The authors talk about the three layers of lateral hip muscles, from the work of Allison Grimaldi. ‘the deepest level, the gluteus minimus muscle; the intermediate level, the gluteus medius and piriformis muscles; and at the superficial level, the upper portion of the gluteus maximus and the tensor fasciae lata muscles (Grimaldi, 2011). Gluteus medius is further divided into a superficial, medial part and an anterior and a posterior deep part (Grimaldi, 2011)’. The authors main arguments are that there is task specific activation of different gluteal muscles, and that the deepest muscle (gluteus minimus) probably works more to pull the acetabulum over the femoral head (as in a hip hitch) rather than abduct the hip. The authors used ultrasound imaging to evaluate the onset of gluteus minimus and gluteus medius (deep and superficial regions) during hip exercises. This is a relatively novel method and the authors note it is not equivalent to EMG which measures an electrical signal as apposed to muscle movement. They hypothesized that there would be task specific activation of the gluteals, and that subtle ‘active lengthening of the leg’ in nonweightbearing (ie like a hip hitch movement whilst lying on your side) would facilitate glut min and med differentiation. 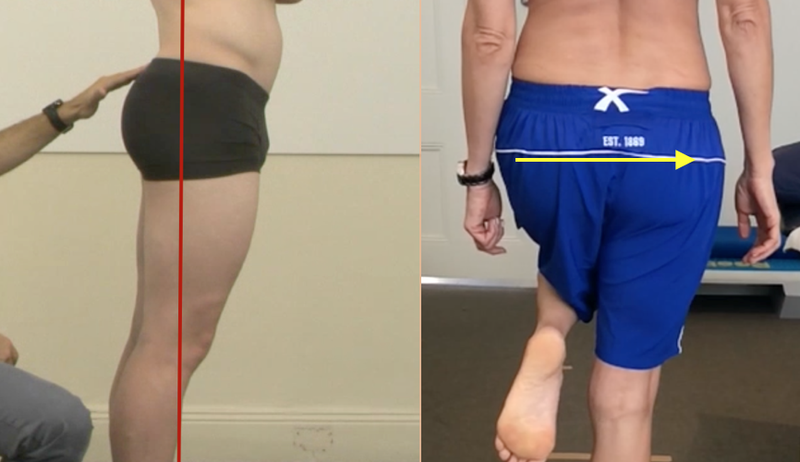 They recruited 20 healthy participants (12 female) and they performed 1) weightshift from double to single leg, 2) a hip hitch, 3) sidelying hip abduction; and 4) non weightbearing active lengthening of the thigh (see photos below). They digitized ultrasound images and were able to detect muscle activation onset based on a change in acoustic frequency that occurs with movement. The main outcome variables were the difference between gluteus minimus and deep gluteus medius onset and the difference between deep and superficial gluteus medius onset. What they found: In terms of mean onset differences, there were no significant differences in glut minimus vs deep glut medius, and only one significant difference between deep and superficial gluteus medius (earlier deep vs superficial onset for weightshift compared with sidelying abduction) (see graphs below). The authors also looked at variability on onsets across the group and found that there was greater variability in weight shift versus hip hitch, weightshift/hip hitch versus sidelying abduction for glut minimus vs deep glut medius, and weight shift versus both sidelying abduction and hip hitch for deep vs superficial glut medius (see figures below). Clinical interpretation: Contrary to expectation onset times were generally not different, even though you can see from the graphs glut min onset generally preceded deep glut med, and same for deep vs superficial glut med. But the differences are not significant so the difference may be measurement error. So the research does not really support the idea that the deep muscle system has an earlier onset to ‘stabilise’, etc, etc. An interesting finding is greater onset variability in motor strategy with weightshift. This suggests the gluteal muscle components do in some way function independently. Maybe weightshift is a good way to develop or redevelop more normal gluteal muscle activation? Clinical utility remains to be seen. We know muscle activation strategy changes in hip and gluteal patients e.g. the same authors found earlier activation of gluteus medius and minimus in a step down task among people with hip pain compared with controls (Dieterich et al. 2016) (maybe protective?). 3) appropriate muscle activation – hard to define what is appropriate and ‘normal’ but there are presentations you could say are not ideal eg TFL working madly and nothing else. These patterns are often secondary to pain (so deal with this as a priority) but cues such as posterior tilt and correcting sway and shift discussed above may also influence motor function. NOTE – cues are not designed to develop an ‘ideal posture’ (no such thing! ), but instead to change motor function and sometimes also pain. What to consider if single leg standing function is poor as described above? You may need to address force capacity, activation patterns or motor control in non-weghtbearing and weightbearing positions prior to or in parallel to single leg standing – obviously all dependent on individual patient presentation. Clearly, lots to think about here and a story for another time, but I can’t finish the blog without giving my favourite gluteal tendinopathy exercise a plug, the standing hip abduction (see photo below). Can be performed loaded isometric (for force capacity) or loaded isotonic (which also provides an opportunity to work on motor control). As discussed above, cues can be helpful to improve motor function. Just a comment on muscle synergist activation e.g. TFL vs gluteal. There is lots of research looking at these and other synergies but the big issue is it is mainly on healthy people and we know that a) motor strategies change in pain; and b) how they change can vary between people. So keeping an open mind and ‘tinkering’ and trying different exercises and cues (trial and error) is the best approach. Simple message of this blog is progressing to weightbearing rehab like weightshift for gluteal patients is important, and this study hints at one potential mechanism, gluteal activation strategy. Importantly, consider single leg standing rehab when the patient is ready and motor control, force capacity and muscle synergists activation strategy are often parallel considerations.